The National Steps Challenge is back with Season 2! Every step brings you closer to amazing rewards! Walk your way to sure-win rewards and amazing Grand Draw prizes including a pair of Business Class tickets on Singapore Airlines to Wellington, New Zealand and a whole lot more! Participants must be at least 18 years old at the point of signing up. 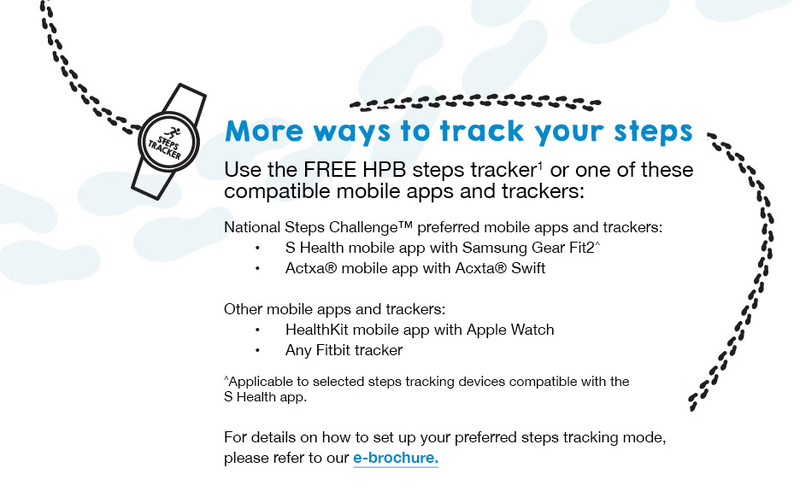 Members of the public who are interested in getting a FREE HPB steps tracker* may wish to join us at our Healthy Lifestyle Festival SG roadshows. Closed on eve of Public Holidays and Public Holidays. Also closed on 14-16 Oct, 28-30 Oct & 12-13 Nov.
Members of the public are encouraged to check www.Facebook.com/HPBsg for updates before heading down to our Customer Care Centre or our roadshows.